Mini Quests has had a minor makeover. No changes to the game itself (in particular no new dungeons this time) but it now has a menu system of a sort. Not very interesting admittedly, but it does finally allow players on Android to adjust the game’s control scheme and screen size. Also, the game has a lovely new home on itch.io. And the source code’s up on GitHub. 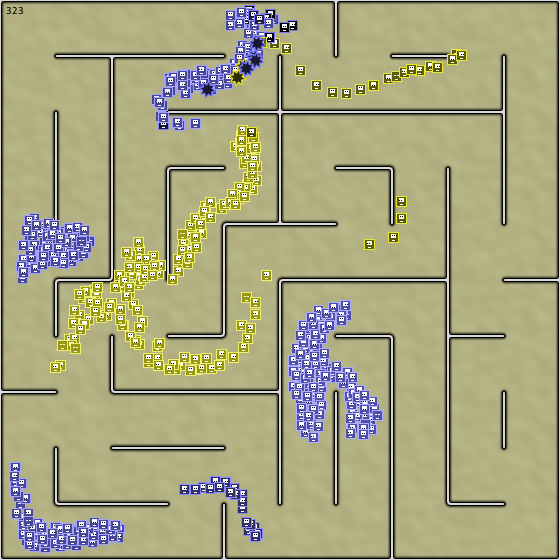 According to the date stamps on the files, I started work on an experimental fluid-in-a-maze game in October 2008, over eight years ago. Two years later it had acquired the name Floxels, but wasn’t much fun to play. A mere six years after that I’m finally happy with how the game is. There’s nothing more to do. It’s finished. Honestly, if glaciers took up game coding they’d get stuff done faster than me. So, to scratch an 8-bit itch, I made a little arcade-style shooter, stupidly called Alien Fish Invasion. It’s a bit like Defender, only tougher, and it runs on the rather lovely Pico-8 console. Floxels is a game I made some years ago, but it never ended up being quite as fun as I thought it should be. So finally I’ve had a go at reinventing it. More fun this time? Yeah, maybe, I think so. New Mini Quests! Four dungeons! Now released! Today Mini Quests hit 100,000 downloads from Google Play, which is rather cool. To celebrate (and by complete coincidence) I’m unveiling… Mini Quests Dungeon #4! The dungeon is in beta at the moment. It’s playable on PC with a ‘modern’ browser (e.g. Chrome) although I’m not sure that the sound effects are playing quite right, so sorry about that. Alternatively, if you hava Java installed, you can download and double-click this Executable JAR [dead link]. I’ll add the dungeon to the full game and release it for other platforms when I think it’s absolutely perfect (a few weeks probably). I’d be thrilled to hear any feedback you have about the dungeon – add a comment below or drop me an email. The beta version will automatically report back some basic playing stats, which hopefully will help me iron out some of the kinks. Edit: Added link to Executable JAR. Update: Beta’s done, new version released! What that means for me is that I have to find a new way to deploy my games. Probably what I’ll do is package them up as Runnable JARs, which can then be downloaded and run on any machine that has Java installed. Not as user-friendly as Applets, but easy for me to do at least. Mini Quests on the other hand may get some special treatment. Through the magic of libGDX, I’m going to try converting it into an HTML5 app, so there’s a chance it may be playable in the browser still. 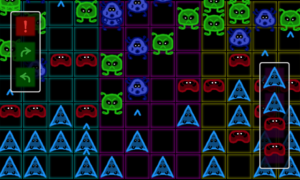 Friends vs Aliens is a ‘tower defence’ game intended for multiple players. It was born from the realization that the only way I could enjoy playing Plants vs Zombies more is if I were playing it with friends. Plus the realization that aliens are easier to draw than zombies. The game is just a prototype/experiment-thingy at the moment, so don’t expect too much from it. Any feedback on its current state would be appreciated. Mini Quests on now available on the OUYA micro-console! That means you can now play the game with a real controller (which is rather nice) while watching the action on your big-screen telly (which is… erm… a little overwhelming to be honest. I’ll probably add an option to shrink the game’s display in a future update). I’ve updated the Android version of Mini Quests so that it’s easier to control on tablets. On-screen buttons mean that you no longer have to have really, really long thumbs to play. The original controls are still better for smaller screens though, so the new buttons only appear if the device’s screen is bigger than about six or seven inches (and it reports its screen size correctly). The game should now recognize the physical buttons on devices – Xperia Play for instance – that are lucky enough to have them (although such devices aren’t all that common and I haven’t been able to test on one directly, so I’m not making any promises). If you’ve connected a gamepad/controller (Bluetooth or USB) then the game should hopefully now respond to that. Android gamepads are unfortunately an ugly mess of incompatibility, so I don’t know that all of them will work, but the game only needs an analogue stick and a fire button, so with a bit of luck most controllers should be okay. If you have any issues with the new controls, then drop me an email or comment below.